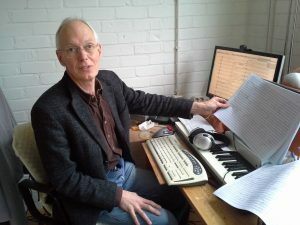 Eduard de Boer (born 1957) studied piano with Thom Bollen, composition with Hans Kox at the Utrecht Conservatory, and orchestral conducting with Anton Kersjes at the Maastricht Conservatory. From 1981 to 1990 he worked as a free lance pianist for the orchestras and choir of the Dutch radio. Then he decided to dedicate himself entirely to composing. Ever since 1981 De Boer has been writing his music almost exclusively in commission. He composed an orchestral overture on the occasion of the opening of the Enschede Music Centre (which he later reworked for wind orchestra); for the opening season of the Eindhoven Frits Philips Music Centre he wrote the cantata The Wedding of the Moon and Sun; and he composed his first violin concerto for the opening of the Tilburg Concert Hall. Up till now he has written three operas, three symphonies, two ballets, two string quartets and many other works, among which many compositions for choir, for symphony orchestra and for wind orchestra. Many of his compositions were written under his pseudonym Alexander Comitas. Several of his compositions for wind orchestra served as test pieces for contests. His Vita Aeterna Variations, for instance, served as an A section test piece during the 2012 European Brass Band Competition EBBC in Concert hall De Doelen in Rotterdam. This composition was also chosen as test piece for the Championnat National de France in January 2014 in Yvetot and for the British Open for brass bands, in September 2014 in the Birmingham Symphony Hall. In January 2015 it was awarded test piece of the year 2014 by the British internet brass band magazine 4barsrest. In October 2017, he was awarded the Dutch BUMA Brass Award for wind music, for his merits in this field. In October 2018 he won the first prize of the Peter and the Wolf composition contest for music for children in Yekaterinburg with his composition The Symphonic Colour Factory. And in December 2018 he was awarded the Premio de Santa Cecilia by the Asociación de Amigos de la Música de Yecla. Apart from his composing activities, De Boer has been active as a pianist and conductor of his own works. He also gives courses and lectures on composing everywhere in Europe and teaches basics of composition at the Leopold Mozart Centre of the Augsburg University. Ed de Boer has understood Rilke, whose poetry has been verbally transformed into marvellous colours, beautiful musical structures and subdued characters. This is a composition of international allure. Und die Audi-Bläserphilharmonie gibt sich ganz der spannungsgeladenen Musik Alexander Comitas’ hin, die luftig leicht flirren kann, mutig vorwärtsdrängt und gefahrvoll donnert, die zarte Sehnsuchtsklänge raunt und rätselhafte Düsternis beschwört, die mit expressiver Wucht und Walzerfröhlichkeit gleichermaßen überzeugt. And the Audi-Wind Philharmonic submits itself completely to Alexander Comitas’ tense music, that can whirr with airy lightness, that bravely presses ahead and thunders dangerously, that whispers soft sounds of desire and evokes enigmatic gloom, that equally convinces with its expressive force and its waltzing cheerfulness. De Boer verstaat zijn vak tot in de puntjes. Boer knows his craft down to the last detail. Wat een indruk maakte de muziek van De Boer: een voorbeeld van zeer toegankelijke hedendaagse muziek. Een ware staande ovatie was zijn beloning. What an impact De Boer’s music made: an example of very accessible contemporary music. A true standing ovation was his reward.